We will proceed further by taking the linked list we made in the previous article. Insertion at the beginning of the list. Inserting a new node except the above-mentioned positions. In the first case, we make a new node and points its next to the head of the existing list and then change the head to the newly added node. It is similar to picture given below. 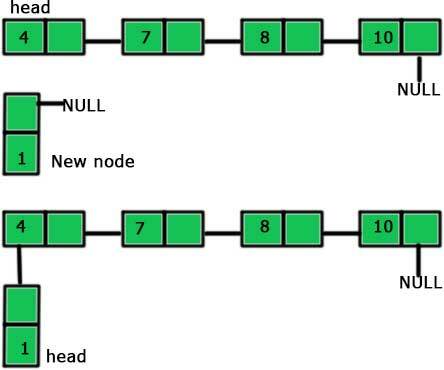 Point the ‘next’ of the new node to the ‘head’ of the linked list. Mark new node as ‘head’. p->next=head – In this line, we have followed the second step which is to point the ‘next’ of the new node to the head of the linked list. These two lines are the part of marking the new node as ‘head’. We are returning the new node from our function and making it head in the main function. The above-mentioned lines are just creating a new node. We are traversing to the end of the list using the above lines of code to make ‘q’ the last element of the list. The third and the last case is a little bit complicated. To insert a node in between a linked list, we need to first break the existing link and then create two new links. It will be clear from the picture given below. Point the ‘next’ of the new node to the node ‘b’ (the node after which we have to insert the new node). 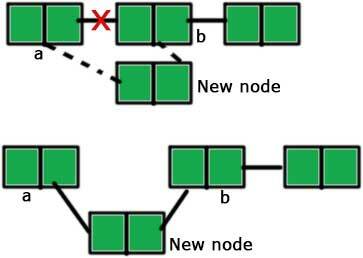 Till now, two nodes are pointing the same node ‘b’, the node ‘a’ and the new node. Point the ‘next’ of ‘a’ to the new node. We are creating a new node using the above lines. p->next = a->next – We are making the ‘next’ of the new node to point to the node after which insertion is to be made. See the comments for better understanding. a->next = p – We are pointing the ‘next’ of a to the new node.